Is the New Flooring Cost Keeping You From Renovating? All new everything! That’s what you think about when you look at your home. You think about changing the color of the walls. You consider getting new curtains for the living room windows. How about a set of newer appliances? Brand new countertops? The list keeps going on and on! Most likely, the thought of giving your house a makeover excites you beyond explanation. But, there’s one thing that you’re really thinking deeply about. You want to remove the old nasty carpet, the lifting tiles, or the stained wood. There’s nothing more off-putting than having everything in order except for the floors. But, maybe you’re a little worried about the new flooring cost. This is a worry for a lot of people so you’re not alone. Many homeowners opt out of starting their home remodel because they get discouraged about the priciness of replacing the flooring. If you’ve pushed off getting started with or completing home renovations because of the new flooring cost, we get it! Changing your flooring isn’t the cheapest job. It can be especially stressful when you’re trying to figure out what kind of flooring you want. Maybe you’re looking for the warmth and classic appearance of hardwood. Or, perhaps, you want the elegance and sophisticated look of stone. Maybe the cost of installing new floors is creating a major setback for you. 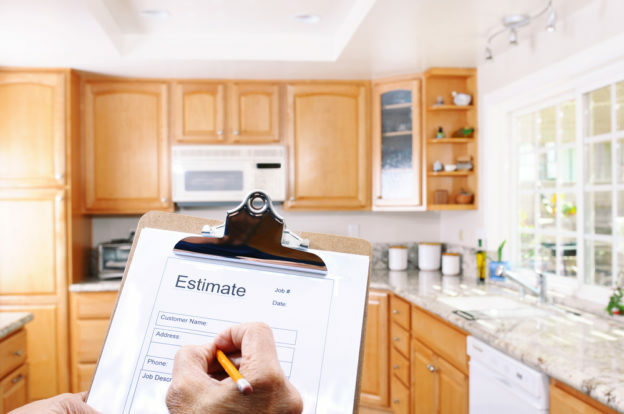 This happens fairly often in the world of home makeovers; many people are a little put off by the amount of money various house projects cost. And, when you’re working towards a house with “all new everything”, it’s easy to become overwhelmed with it all. It can all be pretty overbearing, physically and financially. What if we told you there’s a way around the whole new flooring cost situation? Well, there is! Actually, there are a couple of ways around the problem. First, you might consider finding a way to get the appearance you want without paying an arm and a leg for the flooring. For example, you might choose laminate flooring, which can be made to look like wood or stone but doesn’t cost as much. Vinyl flooring can also give you the wood floor look. Both of these options are much less expensive and still very good choices in flooring! Another thing you can do to help lower the cost is looking into DIY installation. You can probably save some more money by putting your own flooring down instead of hiring a professional floor installation service. Vinyl, laminate, and cork flooring are all possible options for do-it-yourself installation. Okay, so now that we’ve solved the latter part of the new flooring problem, let’s think about the first part. To recap, we offered you a couple of ideas to help you save on the new flooring cost. You can find inexpensive DIY options. Now, on to the first part of the problem: floor removal. This part of remodeling isn’t really that easy sometimes. Unlike floor installation, floor removal is often not a great DIY project. It can be very difficult to get rid of old tiles or rip up matted carpet on your own. But, not to worry! We’ve got a solution for you. DustBusters Floor Removal can work quickly and thoroughly to remove all of the old flooring out of your home! We work on your time and around your schedule so that you can get everything done in your desired time frame. Don’t let the new flooring cost hold you back any longer! You can give your home an amazing and fresher look without breaking the bank! Call us today and let us help you get started! © Copyright 2017 DustBusters Floor Removal. All Rights Reserved.